I was introduced to Soo Ra Sang when it was operational in Koramangala right next to Empire. It was then a home, the bottom floor of which was converted to a restaurant. 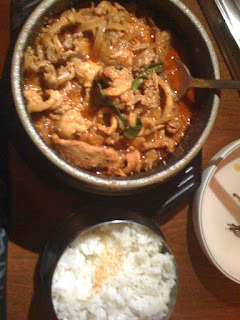 Soo Ra Sang is an authentic Korean cuisine restaurant which is owned and run by Yung (pronounced as “yooung”). This charming place has now shifted to Wind Tunnel road. The restaurant is now on the terrace of a serviced apartment building and has a mindblowing view of the runway of the old airport. Unfortunately all you can see from there are military exercises. Coming to right to the point - Soo Ra Sang (sorry have not found out the meaning and will do so on my next visit there) has two types of seating, the Kings’ Table and the regular seating. The King’s Table is an enclosed sort of wooden bench which surrounds am electric barbeque. You have here the choice of cooking your own food and garnishing it the way you like. There five King’s tables that can comfortably seat four adults and pushing your luck a bit, it can seat 6. The menu is entirely in Korean (English script) with an explanation of what it is. Each item served is a meal in itself. 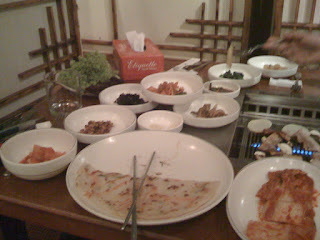 Korean food is characterized by its many side dishes. When you order your main dish, it comes along with at least eight side dishes which range from sweet potatoes to spiced spinach, to tiny fried fish, sprouts of different varieties, potatoes, macaroni salad and several other seasonal vegetables. Every meal begins with a carrot and cucumber pancake served with a soya sauce based accompaniment. On this visit, we decided to start with sushi (because we are such fans!!!!) 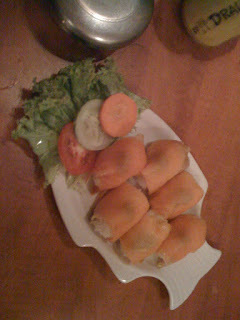 and so Seng Sun Cho Bob was first on the list – this is vinegar rice that is wrapped with smoked salmon. This is served with an accompaniment of soya with a generous dollop of wasabi. For those who have not experienced wasabi – I say this because it is an experience. Wasabi is horse radish chutney and when you decide to have it with your sushi make sure you use of smidgeon of it. You will know you have overdone the wasabi when you feel a tingling sensation in your nose, followed by the sensation of a sledgehammer wallop at the back of your head. Sudhakar opted for the barbeque this time and had the Sam Gyup Sal – which is slices of marinated ham as the base. This comes along with garlic flakes, salt oil, potato slices and lettuce. The grill is set up for you and if you are a novice at barbeque the waiters will help you cook your meal. You will need to constantly baste your meat with the oil, drop in a bit of shredded garlic on each piece, fry the potatoes alongside. Once done to your satisfaction, you take a leaf of lettuce, put in a slice of meat, a length of kimchi (Korean cabbage pickle), the potato some oil, roll it up and enjoy. I opted for the Jeyu Peokk Um which is basically a chilli pork gravy that is served with sticky rice. The pork gravy comes in a sizzler style pot and amazingly remains hot right to the very end of your meal. The sticky rice will take some getting used to and soaks up the goodness of the gravy really well. The pork meat is shredded, a style that is common to the Orient. The meal always ends with cold cinnamon tea which is a digestive and comes in small glass bowls. You will have to ask for regular water here since what is served at the table is a Korean special of water with a hint of corn starch (strange but interesting). The pancake as well as the accompaniments are unlimited at no extra cost. An extra sticky rice will cost you.